There is no lack of ideas for what President Obama and the 111th Congress should do to address three of the most pressing issues they will face when they take office in January – global climate change, the energy crisis, and economic transformation. It may be winter in Washington, D.C., but it’s springtime in national politics. Policy agendas are blooming like cherry blossoms. For example, last week alone, Washington D.C. was introduced to three comprehensive plans to address economy, energy and climate. Two were issued by the Center for American Progress, headed by John Podesta, co-chair of President-elect Obama’s transition team, including an excellent strategy for green recovery by Bracken Hendricks and Benjamin Goldstein. The other was the Presidential Climate Action Plan (PCAP) released during a standing-room only briefing on Capitol Hill, after two years of gestation at the University of Colorado. PCAP contains more than 180 proposals for President Obama and the next Congress, across 18 topics, ranging from natural resource stewardship to public health and from farm policy to zero-carbon buildings and transportation systems. All were designed for action during President Obama’s honeymoon period – the six months in which a new president traditionally sets the tone of his administration, between inauguration and the August congressional recess. Published electronically with hyperlinks to the material behind the ideas, PCAP is the result of 22 months of work involving more than 200 people. Its proposals come from some of the nation’s leading experts on climate and energy policy, from original research, from members of the project’s prestigious national advisory committee and from present and former federal employees who understand the inside workings of government and whose desire to do something about climate has been pent up for the past eight years. 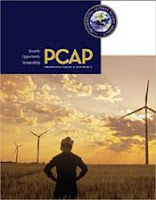 Among the several white papers and studies PCAP commissioned is a keep-it-simple plan for capping and trading carbon emissions, proposed by Yale economist Dr. Robert Repetto, and recommendations from international experts – including Alden Meyer at the Union of Concerned Scientists and Daphne Wysham of the Institute for Policy Studies -- on what the president should do to make the United States an honest partner in international negotiations over climate action.